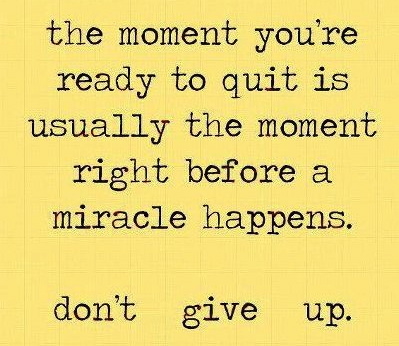 Ready To Give Up? DON’T! These 12 Bible Verses Are For YOU. When facing a difficult situation, sometimes you just want to throw your hands up in the air and give up. When we don’t have the strength to power-through an obstacle on our own, turning to God’s Word for direction and encouragement always helps. I love it! Gonna share this with my friend. Thanks! Hi, Karina .. Never giving up is something we all (especially me) need to remember. God’s Word is our compass and, when we go there, it always helps! I am happy you were blessed by this today! You’re welcome! All the glory to God! Isaiah 40 is one of my favourite passages in the Bible. hi, BEAUTIFUL ~ you are A proverb! Wonderful ! Your’re Beautiful, FOR REAL! GOD Bless! You always. Kavita, thank you. I am happy to hear that you’ve been blessed by the blog. All the glory goes to God 🙂 You brightened my day with your kind words .. thank you. Reblogged this on Words to Love By. How providential that I encountered this post today. 🙂 Thanks, Proverbsgirl. I am so happy to hear that you were blessed by it!!! Makes it all worth it 🙂 Have a beautiful day! Hello, there .. It’s perfectly alright. All the glory goes to Jesus 🙂 I’m happy to hear that you were blessed by this blog. Have a beautiful day! Thanks for stopping by to read my blog today. I love these scriptures you quoted, and your premise is so true. No matter what the question the Bible has an answer. May He bless your day. Awesome!!!!! Going to make a copy of these verses to keep handy . . . and then share them with a couple of friends who are struggling. Appreciate this post very much, thank you. God’s Word is life. Promise. Hope. Love. Everything. Thank you also for the follow on poetrycottage. Blessings.